NYACK, N.Y. (AP) — Gov. Andrew Cuomo officially opened the second span of the new Hudson River Bridge that bears his father’s name, taking the opportunity Friday to criticize Republican President Donald Trump as being “obsessed” with building walls instead of bridges. Hillary Clinton, a former presidential nominee and U.S. senator, joined the fellow Democrat and Westchester County resident for an event marking the completion of the nearly $4 billion Mario M. Cuomo Bridge as crews wrap up work on the second span. 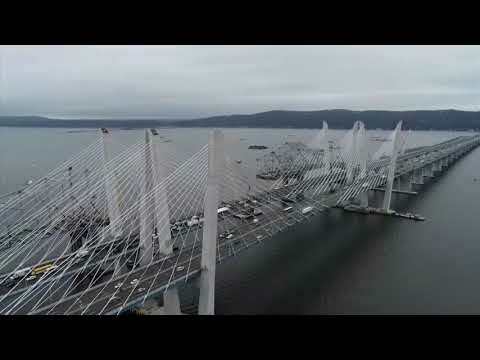 The bridge linking Westchester and Rockland counties 30 miles (48 kilometers) north of New York City replaces the old Tappan Zee Bridge, most of which has been demolished. Sections of the old bridge, which opened in 1955, are being used to build new artificial reefs off Long Island. The younger Cuomo took his mother, Matilda Cuomo, for a pre-ceremony spin across the span in a restored 1932 Packard convertible owned by Franklin D. Roosevelt when he was New York’s governor. Cuomo joked that he had to convince his mother to ride with him since she has never been a fan of his driving. “I said, ‘Mom, there is no one else on the bridge. What could happen?’ It took a few minutes but she took the ride,” Cuomo said. The new bridge’s first span opened last year, when the structure was named to honor Mario Cuomo, governor from 1983 to 1994. He died on Jan. 1, 2015. His son, considered a potential Democratic presidential candidate in 2020, has been a frequent critic of Trump, a native New Yorker who defeated Clinton in the 2016 election. During a speech made before the ceremonial ribbon cutting, Clinton lauded state officials who guided the bridge’s construction and the 7,000 workers who built the twin 3.1-mile-long spans. “It is time for the United States of America to take another look at what’s getting done here in New York and follow this example,” she said. Cuomo said the new bridge, the nation’s largest infrastructure project, has “national significance” because it stands as an example of what the nation can accomplish despite the current deep political rifts. The first span currently carries Interstate 87′s eastbound and westbound traffic. Eastbound traffic will be fully shifted to the second span Saturday morning after crews finish striping the lanes, a process scheduled to start Friday night.